We drove east on Monday with a little black snow cloud in tow. It snowed all the way from Kansas City through St. Louis, Louisville, Lexington and Asheville. We finally found sunshine in South Carolina, where I admired the setting sun’s golden cast across the curves of the Appalachian mountains. We arrived in Nashville under a clear blue sky. I thought I’d share this kale and brussels sprouts salad before we head back to Kansas City (I hope the sunny weather follows us all the way home). The salad straddles the line between winter and spring, with creamy tahini dressing coating crisp green leaves. 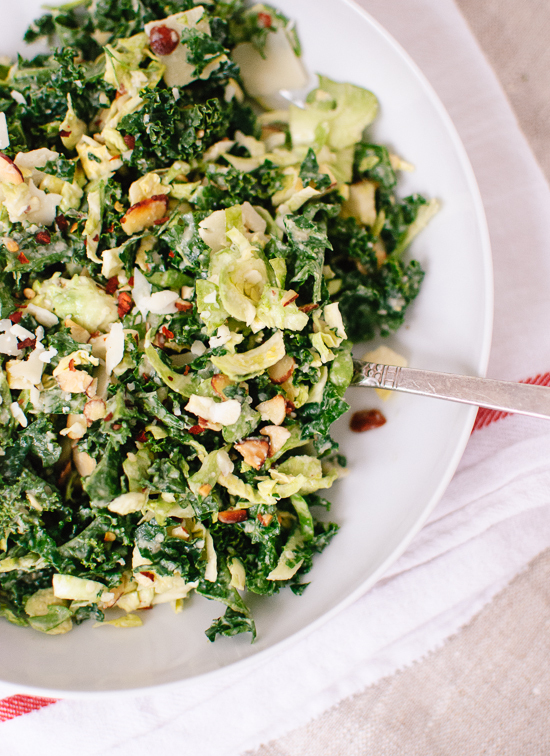 It’s savory and satisfying and almost slaw-like in texture, thanks to the crunchy raw brussels sprouts and slivered almonds. This recipe was inspired by a salad at Westside Local, one of my favorite Kansas City restaurants. They top their salad with pieces of crispy bacon and fried shallots. My less indulgent at-home version relies on Parmesan and toasted almonds instead, but I enjoy this one just as much. I hope you will, too. 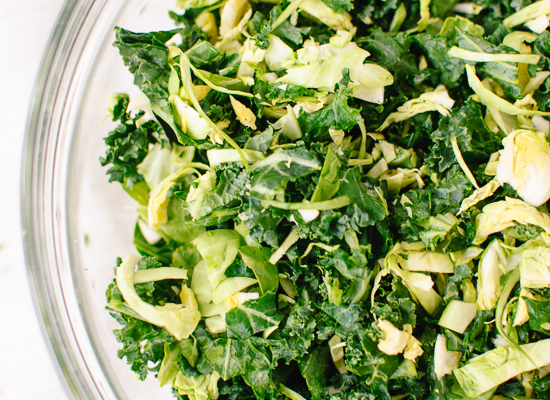 A simple, filling kale salad with creamy tahini dressing. 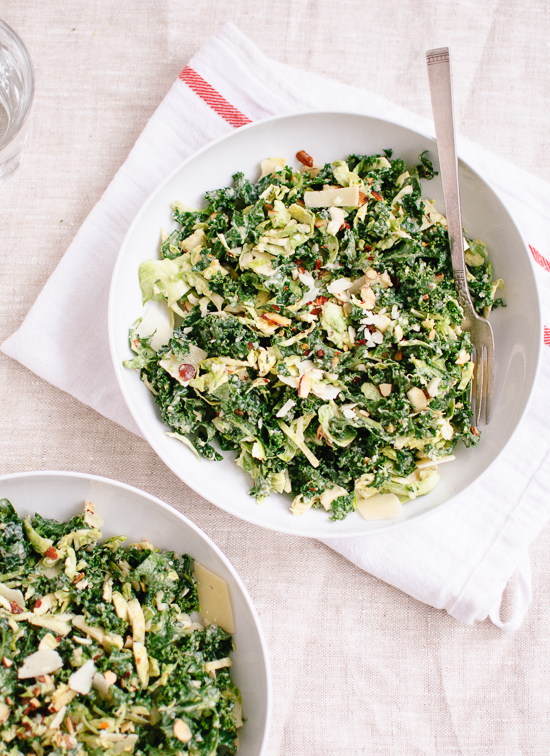 Thinly sliced Brussels sprouts and toasted slivered almonds lend slaw-like crunch, while Parmesan and miso contribute savoriness. Use a chef’s knife to cut out the ribs of the kale leaves. 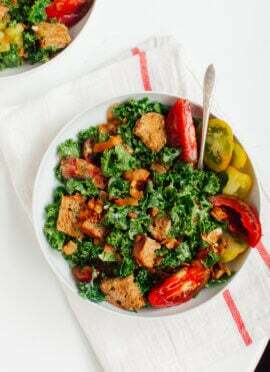 Chop the kale into small, bite-sized pieces. Sprinkle salt lightly over the kale and use your hands to “massage” the kale by lightly scrunching handfuls of kale in your hands. Continue massaging until the kale becomes darker in color and more fragrant. Transfer the kale to a medium serving bowl. 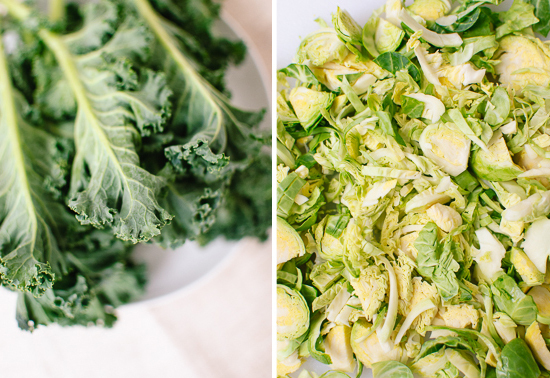 Chop off and discard the stem end of the Brussels sprouts and any discolored outer leaves. Either use your knife to slice the sprouts as thin as possible, or shred the sprouts in your food processor using the slicing disk. Add the sprouts to the bowl and use your fingers break up any clumps. In a small mixing bowl, whisk together the tahini, vinegar, miso, maple syrup and red pepper flakes. Whisk in the water until the mixture is smooth and creamy. Some brands of tahini are thicker than others, so if your dressing is too thick, add a bit more water and/or vinegar, to taste. Pour the dressing over the kale and sprouts and mix well. In a small pan over medium heat, toast the almonds, stirring frequently, until fragrant and turning golden (this will take less than five minutes so watch carefully). Add the toasted almonds and parmesan shavings to the salad and toss. Taste, and add more Parmesan if desired. Serve immediately. 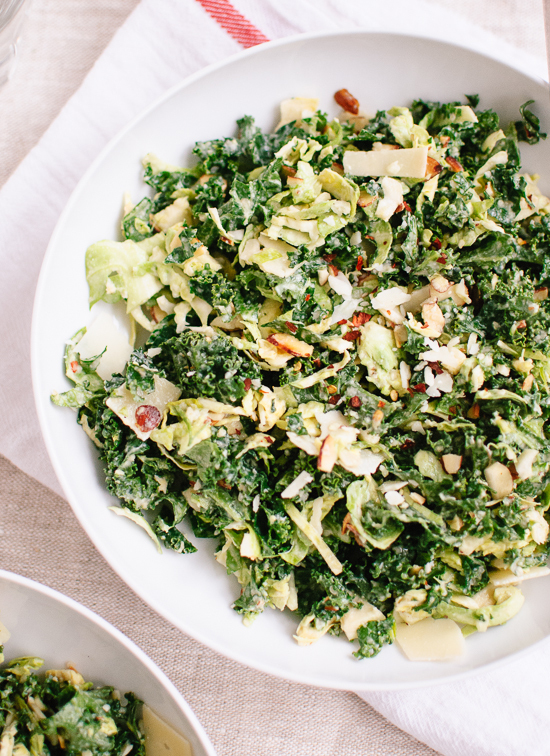 Find my kale salad-making tips here, and more kale recipes here. Storage suggestions: Refrigerated leftover salad should be good for a couple of days. You might want to wake up the flavors with a tiny splash of vinegar before serving. Make it vegan: Simply omit the Parmesan cheese. I don’t have miso, is there something I can use instead? Or will it still be good without? I would maybe add a little extra tahini and adjust the seasonings to taste. It’ll still be good! Thank you for this recipe! I’ve been in a terrible rut but this recipe inspired me. I followed the recipe as close as I could with what I had. I feel like I can eat this every day for a week, in fact not sure if any will be left for lunch tomorrow! I did not have raw tahini (assumed that is what was intended) but roasted (Joya) works fine. Didn’t have Brussels sprouts so used about 3 handfuls of Trader Joe’s Cruciferous Crunch mix instead (kale, Brussels sprouts, broccoli green and red cabbage). I did not have light miso and so used Mark’s suggestion and used 1tsp each of rice vinegar and soy sauce. Can’t wait to try with the intended ingredients! You are welcome! Thank you for the review, Rose. I am happy this recipe helped inspire you again! I just made the salad and it was delicious! Thank you for the recipe! I made a huuuge batch of this salad for a large family thanksgiving dinner, and even my dad — a lifelong carnivore almost never eats veggies unless forced to — loved it! 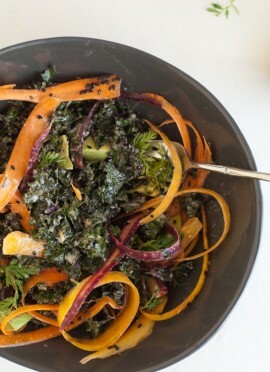 Make exactly as instructed, and do not skip the step about massaging the kale. It really changes the texture and flavor! This salad was interesting. I have never tried Tahini or miso before. I personally liked how the white vinegar changed the flavor. I have concerns though. The Tahini has so many calories. The recipe says this is 2 servings. Based on that serving size my lunch salad was 773 calories. I enjoyed this, but that seems unrealistic as a lunch alternative on a regular basis. Hi Linda, my calculations actually came to half that number of calories with 2 servings. I’m looking at the recipe again and I believe my estimate is accurate. I hope that helps you enjoy the salad more! Had this recipe saved from awhile ago (a few years oops), and finally decided to give it a whirl since I’m trying to live mostly plant based. This was awesome! I didn’t have miso so I left it out, and I’m ok with that. So delicious! If I make this for my boyfriend at some point, I may add chicken because he’s a meat eating boy, and I’m sure it would be phenomenal! PS I just ordered your cookbook and it gets delivered today…counting down the minutes! Thanks for the support! You will love the book. :) I’m glad you liked this salad and thanks so much for the review. I used this recipe mainly for the dressing for a kale salad I made with random ingredients, and it was fantastic! Instead of discarding the kale ribs, I slice the kale into thin ribbons, stem and all, which makes the whole leaf totally edible (using Dino kale)! Thanks for a great recipe! You’re welcome! Thanks for the review, Cynthia. The nutritional information is below the notes section of the recipe. You just need to click to expand. I hope this helps! I’ve always hated raw greens, but know they’re so good for me and have been trying to eat more. This salad is awesome! Who knew I could like raw Brussels sprouts! The dressing is fab and so satiating. I’ll be trying more of your recipes for sure. Thanks! This salad is so good and the dressing gave it the wow factor! This dressing is going to become a staple for our house. 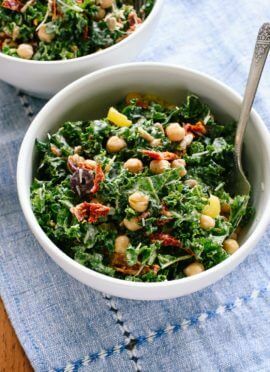 My husband actually asked me if I would make this again this week for him if he picked up some kale…”excuse me, what? !” I’m not sure he has ever voluntarily brought that home in the grocery bag. LOL Kept great for day 2 lunch so make a big batch! That’s wonderful, Emily! Thank you for your review. This looks amazing! I agree with your pared-down version…adding bacon takes away from the healthiness of the salad. Making this tomorrow! (My local gourmet deli makes a similar salad and adds cubes of (baked) yams, which adds more protein and makes for a lovely color combo also.